Freeze cookies ahead and you can have any variety you want ready and waiting at your fingertips. Everyone loves an assortment of cookies but finding the time to bake tons of varieties isn’t easy. Most cookies and cookie dough freezes great, especially anything with a firm batter. Liquidy batters such as madeleines and tuiles don’t freeze well. Make ahead cookies let you bake when you have time and enjoy fresh cookies whenever you want. Baked homemade brownies also freeze well. Double wrap cookies in plastic food wrap to protect them from odors in the freezer. Label, date and add your cookies to your freezer inventory sheet. I’d suggest no more than 3-4 months, some sources quote up to six months and some as little as 4-6 weeks. It really depends on how well the cookies are wrapped. 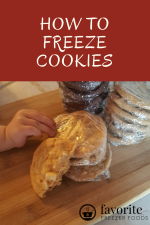 The sources that only say 4-6 weeks recommend freezing cookies in plastic food wrap, which is not a freezer grade product and will not prevent freezer burn. 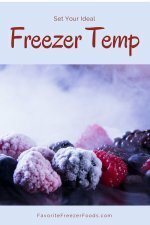 The longer something is in the freezer the more likely it is to develop freezer burn, thusly the way it’s wrapped becomes more important in preserving quality. If you’re going to freeze cookies for three months or more consider wrapping each cookie individually and at minimum use two or three layers of wrapping materials. Make your cookie dough according to the recipe. Before baking or setting aside to chill freeze the dough. Shape your dough like a log that can be sliced or a thick disk that can be rolled out when thawed. Double wrap dough in plastic wrap to help prevent oxidation and odor absorption. Then wrap in freezer quality materials like a freezer bag or tin foil. Shape or cut the dough like you would right before baking and then freeze it on a cookie sheet in a single layer, untouching, for an hour or so until solid so the cookies do not stick together. You can line the sheet with plastic wrap if your worried about the dough sticking. Once solid place in a freezer quality plastic bag. This won’t store as long as a log or disk shape because there is more air in the bag, but it allows you to bake your cookies from frozen. Dough shaped like a log or disk should be thawed in the fridge for several hours or over night before working with it. Once thawed bake per your recipe’s instructions. Dough frozen already shaped, using the flash freeze method, can be baked from frozen. Preheat the oven and put the frozen dough on the cookie sheet just like you would with fresh dough and bake. It can take up to 50% longer to cook frozen items but you don’t want to over bake your cookies. Add about 25% more time than the recipe calls for and keep an eye on them from there. If you want to thaw shaped cookie dough it will thaw much faster than a log or disk because of it’s smaller mass. Freeze cookies that are already baked only after they have completely cooled. Cookies can be frozen in freezer bags or in rigid containers. Rigid containers help keep your cookies from getting crushed or damaged in the freezer. If you don’t have a rigid plastic container place cookies, in a freezer bag first, inside a cookie tin or heavy cardboard box to help keep them safe. 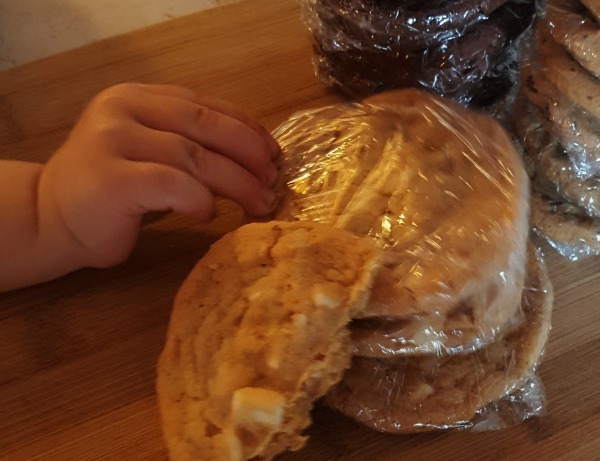 Wrap baked cookies in plastic wrap as tight as you can to keep out as much air as possible. Put layers of plastic wrap, freezer paper or waxed paper between each layer of cookies to keep them from freezing to each other. Frozen baked cookies can be thawed on the counter or in the fridge. If you’re in a hurry reheat them slightly in the microwave, about 30 seconds, or the oven, for about 3 minutes at 350. Times will vary based on the size of the cookies. Who can resist a delicious cookie? Frosting or icing cookies can be done before freezing or after thawing. 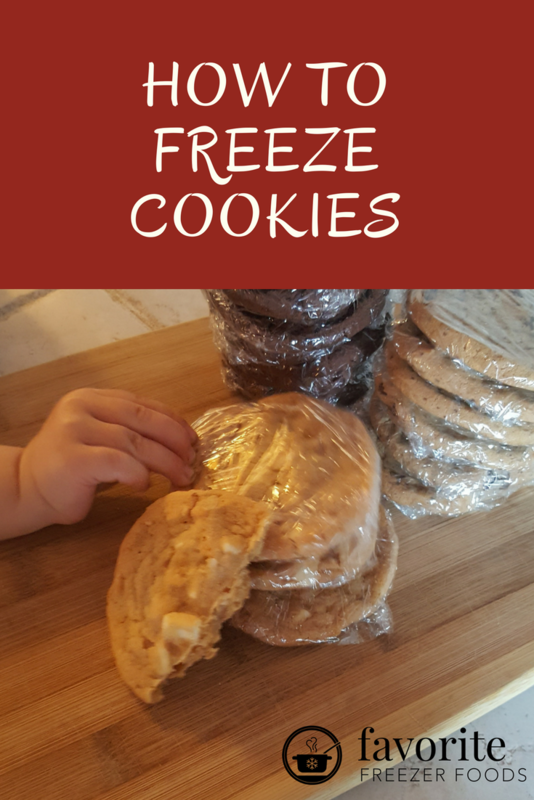 If you frost them first be sure to place frosted cookies on a cookie sheet in the freezer for an hour or until the frosting is firm before packaging for storage. Ideally, you should frost and decorate cookies after thawing so the decorations do not get chipped off or damaged in the freezer. Return from How to Freeze Cookies to the homepage of Favorite Freezer Foods.